Palmer Engineering was selected by the Ohio Department of Transportation to inspect 51 fracture-critical steel pier caps in Hamilton County, Ohio as part of their biannual bridge inspection requirements. Bridges inspected included the Brent Spence, Clay Wade Bailey, and numerous bridges on or over I-75 and I-71 in the City of Cincinnati. Extensive coordination between railroads, police departments, city officials, ODOT, traffic control crews, and inspection personnel was necessary to ensure efficient and safe inspections. 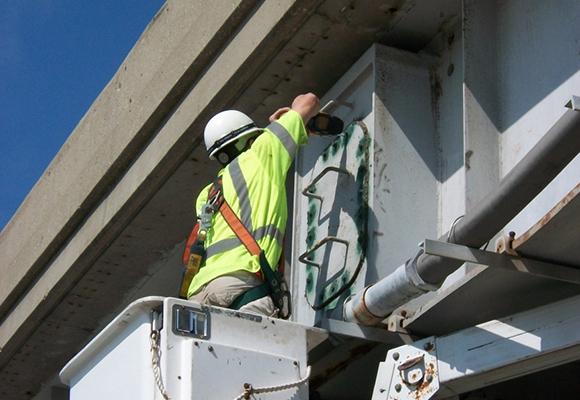 In addition to the inspection work, Palmer is responsible for preparing load ratings for each of the bridges. The analyses require modeling in 2-D and incorporating findings from the inspections. Palmer worked with ODOT to establish the most effective and efficient means of load rating these caps since they have not been previously load rated.